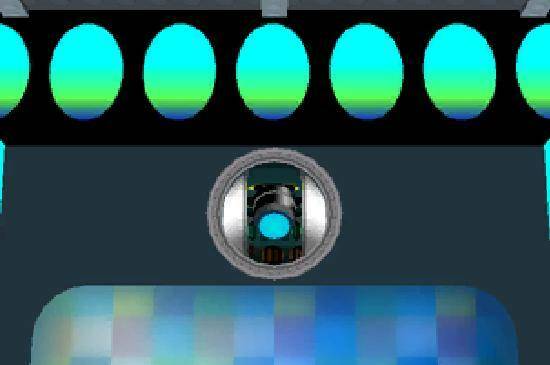 We all have them: certain videogame moments that we are ashamed to love as much as we do. It may be a moment that makes you scream out loud at your television set, only to make you feel like a fool afterwards; or a moment that gets you a little teary-eyed, even though you know the average person would never come close to having the same overdramatic reaction. Sadly, I have a handful of these moments, but the one that stands out the most for me occurs in one of my favorite games for the Nintendo GameCube: Paper Mario: The Thousand-Year Door. The more I look back the more I am humiliated that this moment elicited such an emotional response from me ... until I play the game again and all the same feelings come rushing right back. To be honest, I haven’t even expressed my unwavering adoration for this scene to anyone ... ever. Until now. And what better place to do it then on the Internet. No one would dare make fun of me on the Internet, right? Bask in the warm glow of my shame. The Paper Mario series kind of came out of nowhere for me. When the original was released for the Nintendo 64 it was being hyped as the follow-up to Super Mario RPG (for the SNES), easily one of the greatest games ever made. Once I saw Paper Mario’s “kiddie” graphics, I flipped out and thought this new role-playing game set in the Mario universe was not going to be my cup of level-grinding tea. 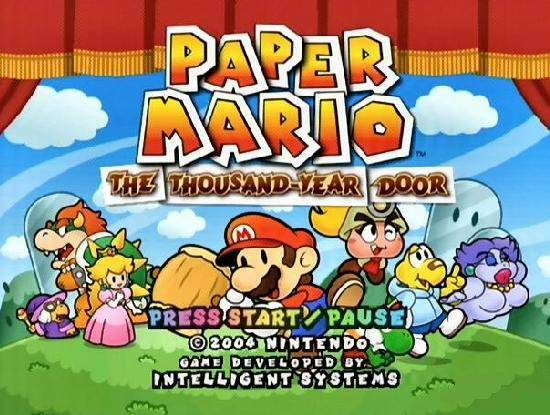 Luckily, I was very wrong, as Paper Mario ended up being one of my favorite games of all time, with its GameCube sequel, Paper Mario: The Thousand-Year Door, being just as fantastic. 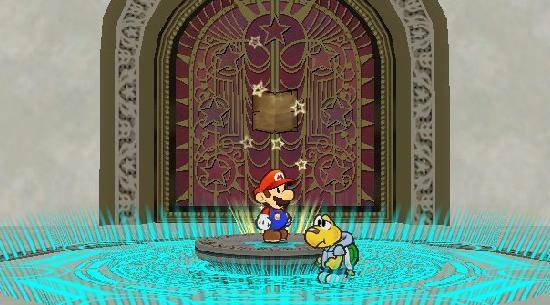 In Thousand-Year Door, as with all the Paper Mario games, you play as Mario as he embarks on a world-spanning adventure. 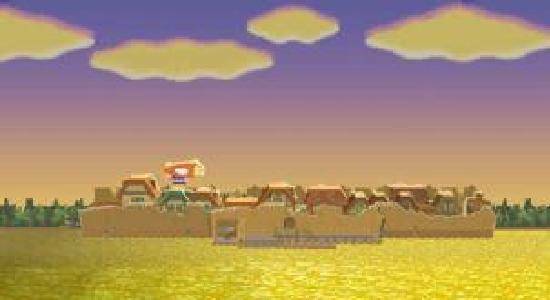 In this game specifically, Mario’s travels take him to the shady town of Rogueport. 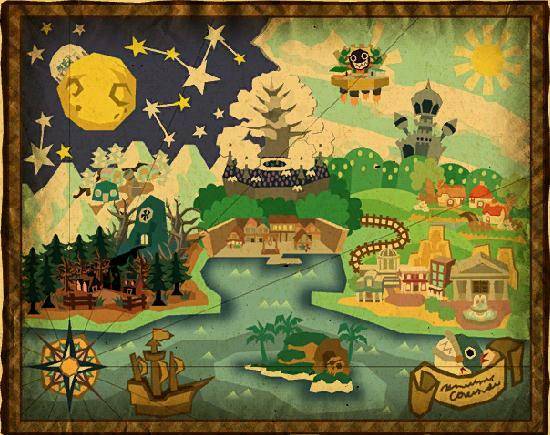 At the very beginning of the game, Princess Peach contacts Mario and tells him that an ancient map located in the port town may or may not lead to a mysterious treasure. After obtaining the map, Mario learns that the treasure Peach speaks of is actually hidden in the ruins directly below Rogueport. Lucky him! Unfortunately, the treasure is sealed behind a thousand-year door that can only be opened by retrieving the seven legendary Crystal Stars that are scattered around multiple far-off locations. Of course. Let the role-playing adventure begin! 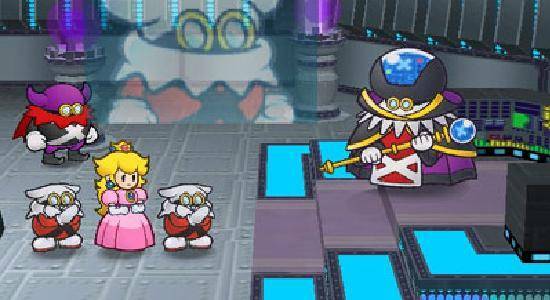 Since this is a Mario game, Princess Peach is eventually kidnapped and locked away in a futuristic fortress by the evil X-Nauts, led by the diabolical Sir Grodus. Not knowing that Peach has been kidnapped, Mario continues searching for the Crystal Stars in the hopes that his quest will lead him to his beloved Princess. 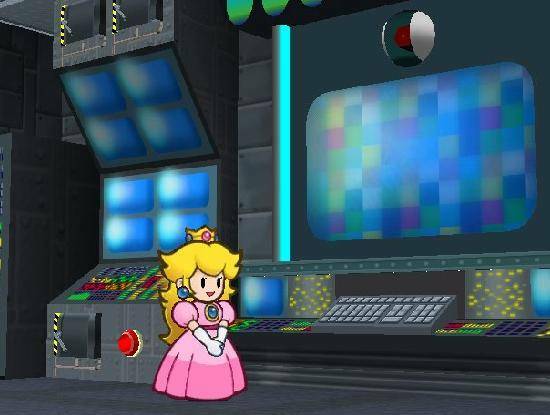 While wandering around the maze-like X-Naut fortress, Princess Peach discovers a massive computer named TEC. TEC is a highly intelligent, “perfect” computer that was designed by Sir Grodus to keep a watchful eye on Peach. Little did Grodus know that TEC would experience a glitch and develop a crush on Princess Peach. It is because of this crush that TEC ends up helping Peach instead of holding her hostage. In exchange for some lessons on what love is, TEC will in turn let Peach send helpful e-mails to Mario to assist him on his quest for the Crystal Stars. At the end of Chapter 2, Peach once again visits TEC to teach him about love (and to hopefully send another e-mail to Mario). 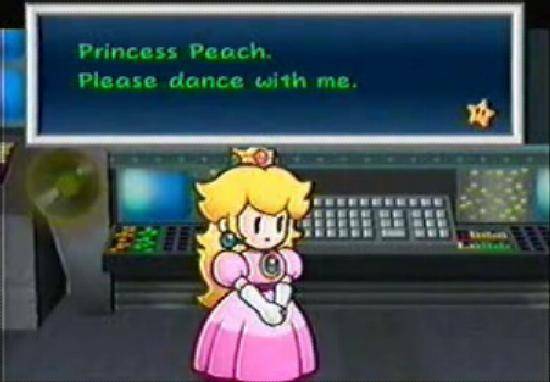 It is during this visit when the next Memory Card moment occurs: Peach dances with TEC. 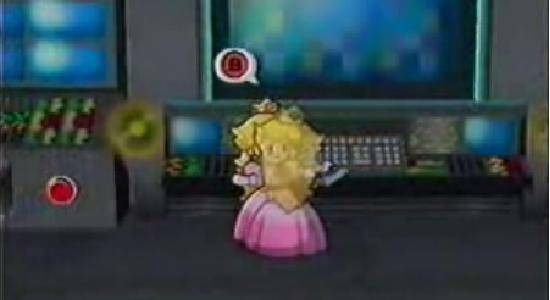 Right before entering TEC’s room, Peach talks to herself and expresses her disappointment that she won’t be able to attend the Mushroom Kingdom ball this year because of, well, her being kidnapped and all. After shrugging her shoulders, she makes her way to meet TEC and begin another lesson on love. As the new lesson starts, TEC stops Peach and asks her why she is so upset about not being able to make it to the ball. 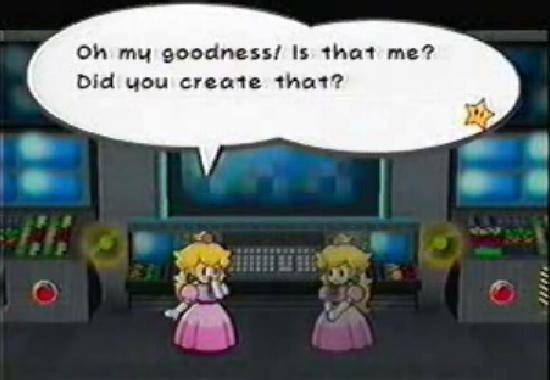 At first, Peach is offended that TEC was eavesdropping on her private thoughts, but the computer quickly apologizes. 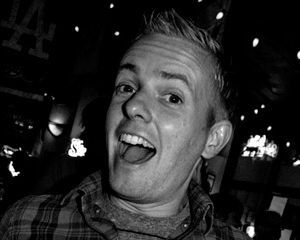 TEC then asks if he can dance with Peach. He doesn’t know where this new, strange urge is coming from, but he knows it will make Peach feel better since she seems to be so upset about not being able to dance at the Mushroom Kingdom celebration. Peach is surprised and confused by this offer, having no idea how she would even attempt to dance with something that has no arms or legs. TEC suddenly comes up with an idea. He produces a holographic image of Peach herself and asks if that would be an acceptable dance substitute. Peach hesitantly agrees and begins dancing with the transparent image. At this point, some sweet music begins to play as Peach and TEC start to dance. Instead of just watching the dance, the player is actually required to press specific buttons as they appear on-screen. Granted, it is not challenging by any means, but it at least adds a little interaction. Once the dance is complete, TEC declares that he had fun, another new emotion that he has never experienced before since being created. With this, a now blushing Peach sends another e-mail to Mario and the charming scene ends. If you can, try to hold off your laughter for just a few more paragraphs. Trust me, I would be laughing at myself right now if this scene genuinely didn’t make me feel all warm and fuzzy inside. So why do I love this sequence so much? Well, first, in a goofy game like Paper Mario it is nice to witness a scene rooted in genuine emotion. Yes, I know, it comes across as being a little heavy-handed, but the relationship between TEC and Peach -- as ridiculous as it is -- is actually quite moving. BAW! It gets me every time. As cheesy as it sounds, the dance sequence also reminds me of the scene in the movie Ghost when Molly dances with her deceased husband Sam using Oda Mae Brown’s body as a vessel (not yet -- hold back that laughter -- I’m almost done). Just like Sam, TEC wants nothing more than to dance with the woman he loves, but doesn’t have the means to do it. It’s the classic theme of loving someone you can never have ... someone you can never touch. I know you must be thinking I am reading way too much into this scene, but play the game for yourself and try to tell me there isn’t a small part of your heart that is touched by TEC’s ultimately tragic infatuation with Peach. If you look past the wacky Paper Mario exterior, a pretty touching relationship is hiding inside. The moment when Peach and TEC dance is, of course, not comparable to some of the more emotional moments experienced in other videogames over the years -- that’s why I am so embarrassed to love it! But that doesn’t change the fact that it still moves me and will always remain one of my most memorable videogame moments of all time. Okay, you can go ahead and laugh now.